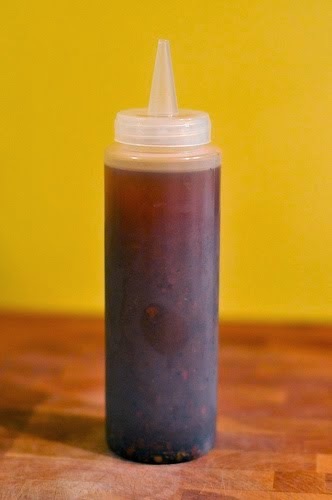 An example of an East Carolina BBQ sauce. Everyone has a favorite barbeque sauce, especially when it comes to pork. This is nowhere more true than in North Carolina. What you get depends on what region you're in at the time. Some will serve you a tomato based sauce, some mustard based, but in Eastern Carolina (where I lived) they use a straight up vinegar/ pepper sauce. Whether it's used as a mop for a slow roasted half pig (good ol' pig pickin's,) or as the main condiment/final ingredient in pulled pork, this is my favorite of the three. I hope it's yours, too. Put all the ingredients together in a pot, heat at medium low, stirring and adjusting to taste. Remove from heat, let cool, use what's needed. The remainder can be stored, refrigerated, up to 6 months in a tightly closed container. In fact, the longer it sits, the better it tastes!